Recently elevated from one to two stars, this South Loop treasure emphasizes elegant contemporary American cuisine inspired by coastal Maine. 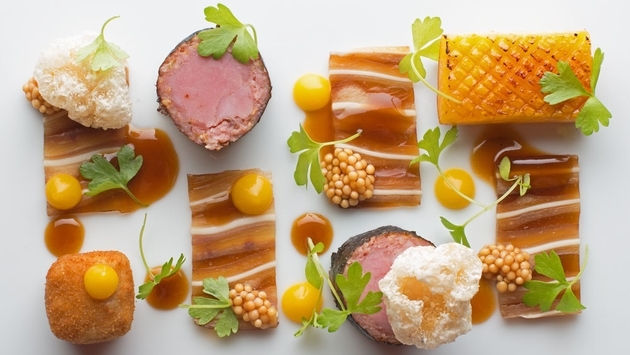 Acadia offers five and 10-course tastings that include seasonal standouts like Elysian Fields lamb and caviar. A consistent favorite with critics and visitors alike, Alinea chef Grant Achatz is a visionary who creates culinary fine art. The Lincoln Park standout has been one of the most popular dining destinations in the city since its opening in 2005. With three stars, Alinea is one of the most sought-after reservations in the city and was called the best restaurant in America by Gourmet Magazine. The menu is always evolving but look for signature’s like Black Truffle Explosion. A fantastical place where you might be prompted to lick your plate as part of the experience or served “culinary cocaine,” El Ideas is like no other restaurant you’ve seen. Chef Phillip Foss likes to challenge guests with offerings like a raw milk course served in a baby bottle and a “Twix Bar” of a chicken liver crouton dipped in chocolate. The restaurant boasts one star, and with fixed price meals and BYOB set up, it’s an unexpected Michelin experience in every way. The El in the name stands for the Chicago elevated train and the idea part prompts you to question everything you know about fine dining. A funky eatery that serves up impeccable Korean American small and large plates, Parachute recently won a well-earned Michelin star. Run by a husband and wife chef pair, (Beverly Kim was featured on Top Chef Texas) this warm and approachable spot serves a fusion of Korean and Southeast Asian influences. Look out for the torn noodles with a spicy, crunchy lamb sauce.